When I bought whole side of salmon I saved tail end for sushi roll and sashimi. I do not use ton of ingredients that you will see in California roll. 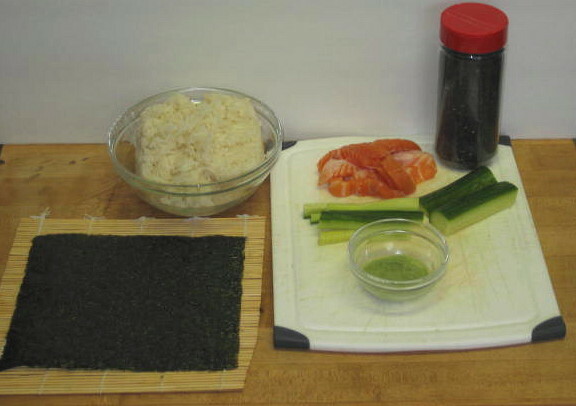 For us it is just sushi rice, nori (sushi seaweed), cucumber or avocado, salmon, wasabi paste and sesame seeds. There is a website dedicated to sushi making called Sushi Encyclopedia that has very detailed instructions so there is no point for me to go into a great detail. Clockwise from top left: rice, salmon, sesame seeds, cucumber, wasabi and nori. 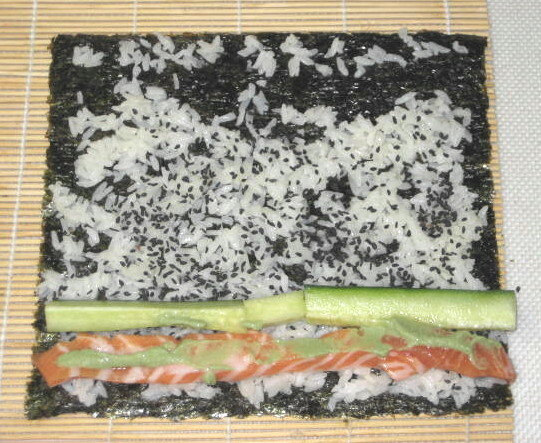 Sesame seeds are sprinkled on rice, then salmon a cucumber goes on top and wasabi paste on top of salmon. Ready to roll. 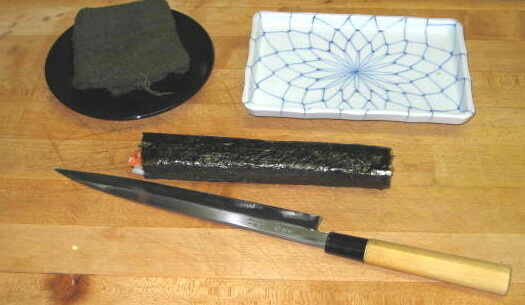 Roll is ready to be cut first in half, then clean cut the ends and finally put 2 halves together and make 3 equal slices. You have 6 slices ready to be served with soy sauce and pickled ginger.